The people who make us who we are today. To have a great company, you need great people. Not just experts in their craft, but all around lovely people who are easy and fun to work with. Those are the types of people you’ll find on this page and in every aspect of your Contract Furniture Inc. experience. Darla began her career working for an architectural firm in Detroit, but when the firm relocated to SE Florida, Darla jumped at the chance to go with them. After a successful career working for other firms she was ready to branch out on her own. 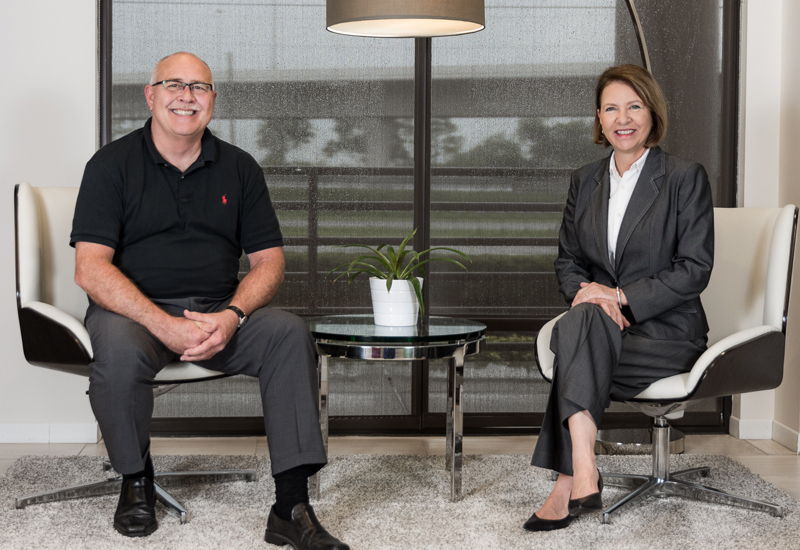 She and her husband Mike, started Contract Furniture Inc. 20 years later it’s one of the best office furniture and design showrooms in Central Florida. When she’s not working, Darla enjoys spending time with her boys, enjoying good food, good wine, and good friends. Darla and Mike just welcomed their first grandchild this August, and could not be happier. Mike is a native of Michigan but has been a resident of Florida for more than 35 years. He enjoys collecting Harley memorabilia and riding motorcycles in his spare time. Additionally, it is football season, his favorite time of year. But mostly, Mike enjoys spending time with his family, his wife of 37 years, and his granddaughter. With a background in interior design, Trisha is always working on things to improve around the house from installing crown molding to gutting and re-installing the master bathroom. Her new favorite past time is building furniture and getting to play with all the power tools required for the job - who knows, she might just be on HGTV soon! Stacy and her family relocated to Florida from the Midwest about 5 years ago for the warm weather, sun, and sand. While not at work, she loves spending time with her family, hanging out at the beach, and binge-watching Food Network. Kristen is originally from Michigan and is the biggest Michigan State fan. Do not say “Go Blue” around her. When she’s not designing, she’s spending time with her husband, beautiful 1-year old daughter, and taking trips to Disney. Kate is a true Florida native, born and raised near Cocoa Beach, but settled in Tampa after school. When she’s not working, she can be found boxing, traveling, at the dog park with Murphie, or spending time with her friends and family. She’s happiest with a cold beer and some sunshine - oh, and she says “y’all” a lot . Carmen escaped the Northeast’s harsh winter of 2018 just in the nick of time to settle in sunny Florida. Outside of work you can catch her enjoying the theater, traveling, and attending arts & craft fairs. If you ask her about missing New York she’ll say, “some rain beats shoveling a couple of feet of snow! Robert is a former Marine who used to be an adrenaline junkie…now he spends all his free time with his daughter, watching her grow up faster than he thought was possible. When Amy is not working she is always keeping herself busy. She can be found volunteering at the local shelter with dog adoptions, exploring the art culture around town, shopping for the perfect find, enjoying the outdoors by doing beach yoga, paddle boarding, fishing, or just soaking up the Florida sun. And most notably, Amy is also is a mermaid. (See the Coney Island Mermaid Parade). Jeff is an adventure addict. In his spare time, he loves riding his bike, learning to play his guitar, listening to music, enjoying his two chihuahua’s, learning new things, and spending time with family and friends. He comes up with new ideas all the time, if only there was more time to implement them. Debbie was born in Alaska, but has lived in Tampa from a young age so she considers herself a true Floridian. When she’s not at the office, Debbie is spending time with her family, which includes 5 adorable fur babies. On any given weekend you can find Debbie relaxing at the beach with a cocktail, getting creative with new recipes, and attending to her ever growing plant collection that has slightly taken over her courtyard. Soltana is our world traveler! She recently joined our team with 12 years of international experience in interior design and furniture. Both her career choice and international can be attributed to her passion for traveling, heritage, history, graphics, and learning about new cultures and languages. She is big time football/soccer fan, enjoys basketball, and all water activities except fishing.